Day dais and the audience in the invocation. Ann Schwartz, Joshua Levine, and Nathan Phillips. his joy over the new complex. took place on Dec. 20.
secure our future in the world." ing for the future of our school." faith and to the community. where education is so important. ready and willing to be involved,"
Emotion-Packed Caricatures 'Portraits of Infamy'. to Daniel D. Cantor, Ludwik Brodzki, and Harold L.
Dorothy Small, Pola Brodzki, and Jean Kletzky. By RABBI 8- "Go and Learn." witnessing a 5. ^ ScroU of the Torah. books of the Jewish Faith? give to the seeker of faith? 6- What is a Chuppah? "Patriarchs" of song and poetry? home about to be established. And that will bring delight. release of our Soviet brethren. Broward at a March 10 function. DR. HERBERT H. PAPER, Professor of Linguistics and Near Eastern Languages DR. NORMAN J. COHEN, Professor of Mldrash and Director of the Rabbinic School In New York. DR. ABRAHAM J. PECK, Administrative Director of the American Jewish Archives. "Sholom Aleichem as a Social Critic: A Re-Reading of his Genius," Including the reading of stories never before translated Into English WILL SPEAK ON "A Modern Encounter with the Mldrash," a journey through the legends of the rabbis. "The American Jewish Experience; Survival Strategies," exploring whether the painful memories of the holocaust and the optimism of the State of Israel can keep American Jewry afloat. Our sporttcomplex featuring nunialure golf, paddle tennis, basketball, ping pong. King David Out door Grid* The New York Dell Clublntcnationale with continuous music. real estate gifts can be realized. less fortunate cause for thanks. open and your phone free on Jan.
to pay it off, so please give. life in years to come. tier at the Federation, 748-8400. Building at Kfar Saba, Israel, our Project Renewal sister city. elderly project for the Jewish Federation. Coming ... "Super Sunday '88"
Please reserve a telephone for me. Published WMkly November through April. Bl-We*kly W_H ot ynr. Jewish Fleridiea Dees Net Gaaraatee Kasfcrata of Mtrcaaaatac Advertise*. Jewish Federation of Greater Fort Lauderdale: Sheldon S. Polish. President; Kenneth B. Blerman. be addressed: Jewish Federation ot Greater Fort Lauderdale. P.O "
? 8:15 a.m. to 11:00 a.m. ? 10:15 a.m. to 1:00 p.m. D12:15 p.m. to3:00 p.m.
? 2:15 p.m. to 5:00 p.m. ? 4:15 p.m. to 7:00 p.m. D 6:15 p.m. to 9:00 p.m.
now can sit up in a wheelchair. the Business Executive Network greeting the guest speaker F.
Appeal campaign on Sunday, Jan.
just because the economy is down. help with the community needs. ed' into the reality of the time. name on this year's program. the food for this occasion. sary Community Mission to Israel. 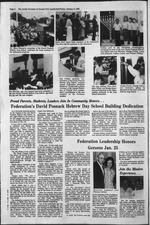 Jewish Federation for five years. Guest Speaker Ruth Gruber Kranberg. chairman; Samuel K. Miller, Condo Cabinet chairman; Daniel D.
our guest speaker at this event. way with their December events. percent ahead card for card. pay tribute to Myron "Mike"
tion/UJA Sabath on Friday, Jan.
Sunrise Blvd., Plantation, on Feb.
date on Israel. 2 p.m. Theatre. Jan. 11 Women's Division Meetings. 9:30 a.m. Exec. 10:30 a.m. Board. Jan. 13 Holiday Springs Cocktail Party. Jan. 13 Fast Track Lecture Series. Federation's CRC Sponsors 'A Women's Plea for Soviet Jewry'..
munity. It will start at 7:45 p.m.
leave Russia," said Barbara K.
strength of the Jewish people." one of the luckier refuaeniks. FSUC, an agency of the U. S. government. dedicated to making you feel at home. tions in the state of Florida for 1986. We go out of our way on your account. Call this number for all branches: 493-5100 or (800)336-2666. Corporate headquarters: Fort Lauderdale, 2000 W. Commercial Blvd. crowd, no matter what language. and defenders of her native land. JCC facility "manning' a phone. Water, from a natural spring in Hot Springs. Arkansas. sion of his Bar Mitzvah on Jan.
Mathew Levine, son of Mr.
Elana Oko, daughter of Mr.
Bar Mitzvah on Saturday, Dec.
ple Beth Am in Margate. on services on Friday evening. Fort Lauderdale on Jan. 27. Widry, son of Mr. and Mrs.
at Temple Beth Am on Dec.
Jan. 2 at Temple Beth Orr. of the local Jewish community. Service group should contact Mrs.
day 8 p.m., Saturday 9 a.m., 6 p.m Rabbi Avarea Draato. Caatar Irria Bail. TAMARAC JEWISH CENTER (721-7660), 9101 NW 67th St, Tamarac, 88821.
day 8:46 a.m. Rabbi Kart F. Stone. I Paal Pletkia. RaaM Eatorrtas. Dr.
TEMPLE BETH ISRAEL (742-4040), 7100 W. Oakland Park Blvd., Sunrise, 3S31S. Jeeeah Laagaer, Caator Shabtal Aekenaaa. TEMPLE B'NAI MOSHE (942-6880), 1434 SE 3rd St., Pompano Beach. 38060. Service*: Friday 8 p.m. Caator Jeaadah HeUhraaa. TEMPLE SHA'ARAY TZEDEK 741-0296), 4099 Pine Island Rd., Sunrise, 38821. 8:48 a.m. RaaM Israel Halaera. Friday at 6 p.m.; Saturday at 8:45 a.m. Charles B. Friar, President. 8 a.m.. 6 p.m., Saturday 8:46 a.m.. 6 p.m.
Deerfield Beach, 33441. Service*: Sunday through Friday 8 a.m. and sundown. U Casual Seaaoiaar. Ciagnaallaa aaaaldaat: Hersaaa Fleischer. TEMPLE EOL AMI (472-1988). 8200 Peters Rd., Plantation, 88824. Sunriae, SSS61. Services: Friday 8 p.m. RaaM Deaai* WaM. Friday 8 p.m.; Saturday 10 a.m. RaaM Mark W. Grose.
' Chapels. 2806 W. Hillaboro Blvd.. Deerfield Beach, 88441, Friday 8 p.m.
than H. FUa. Caator Merrio Leviaooa. EMANU-EL (781-2810), 8246 W. Oakland Park Blvd., Lauderdale Lake*. Bat Mitavah. RaaM Jeffrey oVaUea. Caator Rita Shore. vice: Weakly on Friday evenings at 8 p.m. Rakai Lewie Ltttesea. or their suitcases, or their shoes. human life that took place. this trip which just floored him. resume in the next iaane. Show for March 16, 1988, has not been cancelled. your order forms and checks now. ment Capitols in the country. Auditorium on Sunday Jan. 24.
ple Israel of Deerfield Beach. of the class on Wednesday, Jan.
from 9:30 a.m. until 11:30 a.m.
sizeable funds from the state,"
Jan. 28 at Temple Beth Israel. Prices effective Thurs.. January 7 thru Wed..
in Dade, Broward. Palm Beach. Martin. St. Lucie.